Virtual Card is a limit Credit Card/Debit card, which can be created using your bank's Internet Banking facility for e-commerce (online) transactions. A Virtual Card can be used to shop online at any merchant website that accepts Visa Cards, without any difference from a regular plastic Card. These cards are easy to use as no separate setup/ installation or registration is required. Any customer having internet banking facility with transaction rights can create Virtual Card. These cards are more secure as it reduces the risk of exposing the underlying Credit/Debit limit as the Primary Card / Account details are not communicated to the Merchant. You can cancel the card at any time online. In the case of Virtual Credit Cards (VCC), set the credit limit to the amount you want to transact with website. While in case of Virtual Debit Cards you have to generate it with a pre-loaded amount which gets deducted from your account only after transaction. You can use Virtual Debit Cards like plastic credit cards the only difference with Virtual Credit Card being you need to have a primary credit card while a Virtual Debit Card will be issued by marking a lien on the selected account and actual debit to the account will take place only when the Card is used. These Virtual Cards are very safe as the customer details (bank account No., mobile No. , email address, etc) are not shared with Merchant / Vendor. State Bank of India: State Bank of India offers Virtual Debit Cards. These cards are valid for a maximum of 48 hours of its creation and only a single transaction can be made with it. All unused money will automatically get transferred to the savings account after the expiry of the issued VCC card. HDFC Bank: They call it NetSafe. HDFC was the first bank to introduce Virtual Credit Cards in India. 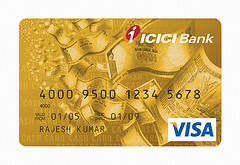 ICICI Bank: ICICI Bank provides VCC as an add-on credit card to your primary card. Your virtual card expires after 2 business days or the number of transactions you have indicated, whichever is earliest. Kotak Mahindra: Kotak Mahindra offers VCC with netc@rd. 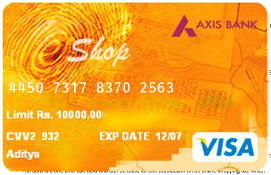 Axis Bank: Axis bank offers eShop and it is one of the most flexible Virtual Credit Cards in India. How to Apply for a Virtual Credit Card in SBI (State Bank of India)? Login to your SBI online banking account (https://www.onlinesbi.com/). Navigate to the e-Cards option present on the menu bar. Next, fill the amount (VCC limit). Agree to the terms and click “Generate” button. Again click “Generate” on the next screen to confirm. You’ll be provided with a virtual credit card on which you’ll find all the details that you require. How to Create a Virtual Credit Card in HDFC? Go to HDFC Netsafe service website and click “Login to NetSafe” link on the right side. On the next screen, click on “Register” button. Click on “I Accept” button. On the next step, enter your HDFC credit card/debit card number, expiry details and click “Submit”. Note: if it is a debit card number, you’ll be asked for your ATM PIN number. Next, enter your mobile number, security/secret text and other personal information. Next, enter a unique username and password for your NetSafe account. Your account is now registered. Next, you’ll have to generate a Virtual credit card. Login to NetSafe service and enter an amount (limit). Click “Go” to create a virtual credit card. That’s it! You’ll be provided with a virtual card which you’ve to use within the next 24 hours or else it will be automatically expired. You can use the card in two ways, either copy the NetSafe card Number as the card Number required in the payment screen of your shopping site, or just download the Plug-In during the Registration process. Note: You can view all your transaction details if log into your NetSafe account and navigate to the “All accounts/services” > Txn. How to Create a Virtual Credit Card with ICICI Bank? Enter your Internet banking user identification and log-in password to access your ICICI online banking menu. Receive these items as two separate mailings in seven to 10 business days when your account is opened at ICICI bank. Click the option in your online banking that assists you in creating a virtual debit card. Enter card options. Indicate how much money and how many transactions are permitted on the card. Funds are debited immediately from your checking, savings or credit card account with ICICI bank. Receive your 16-digit Visa debit number and three-digit security code for immediate online use. Your virtual card expires after making your indicated number of purchases or after one to two business days. 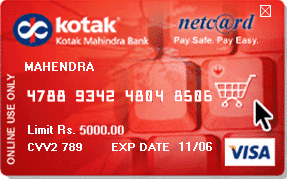 How to Generate Virtual Credit Card at Kotak Mahindra? Login to your Kotak net banking account. Select “netc@rd” tab and click on “Generate Card”. Select your account and enter the amount (VCC limit) to generate the card. Having a virtual card saves you the hassle and risk of carrying large amounts of cash out in the street. I must say it is quite convenient carrying them these days. The only downside to this is that troublesome "we don't accept credit cards" at the register. Very useful for people who does not have international credit card or do not want to use your own card in international site.